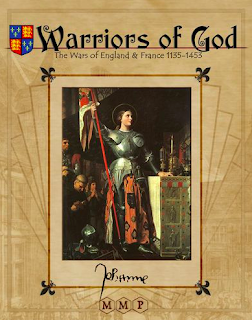 As the long wait for Pragmatic Sanction to be released by Avalanche Press continues I've been grinding away at the Hundred Years War project. Here's an update. Another decades-long dream was having a study with display cases full of figures. The Seven Years War stuff occupied the two cases against one wall (with a few shelves free for players to be named later). The 28mm collection (with a top shelf earmarked for getting into Malifaux) got their own case a couple of months back. I'm approaching the point where I can't do any more units using plastic Perry and Fireforge figures (with the odd Perry metal thrown in) and the remainder will have to be metals figures ordered from Foundry. Here's what's completed so far. In September Frederick withdrew the main Prussian army from a devastated Saxony where it was proving difficult to sustain his troops even before the onset of winter, and concentrated at Magdeburg. Once news of this reached Browne in Mecklenburg, he immediately shelved plans for a follow up drive in that direction, and instead chose to pursue Keith into Pomerania. The Scottish general, once again eyeing the odds, fell back south to Berlin, allowing Browne to lay siege to Straslund. 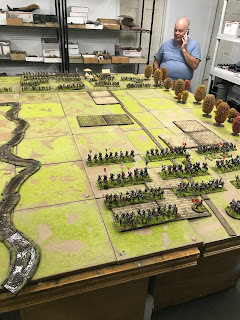 The city fell on the 26th and Browne left a token garrison of Saxons there, before falling back with the rest of his army to safer Winter quarters in Mecklenburg. With the newly launched Italian expedition going badly, Spain could ill afford to still be at war with Britain. 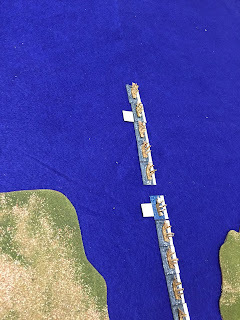 Were the Royal Navy to reappear in the Mediterranean in strength then Spanish communications with their beach-head in Tuscany would likely be severed.